Decorate small bathrooms to create the illusion of space. Here are some cheap,easy and simple decorating ideas to make a small bathroom look and feel larger. Depending upon the decorating style, a small bathroom can look either cozy and welcoming or stuffy and confining. Bathroom room decoration is a fun and interesting exercise and a small bathroom can easily be decorated to feel larger. 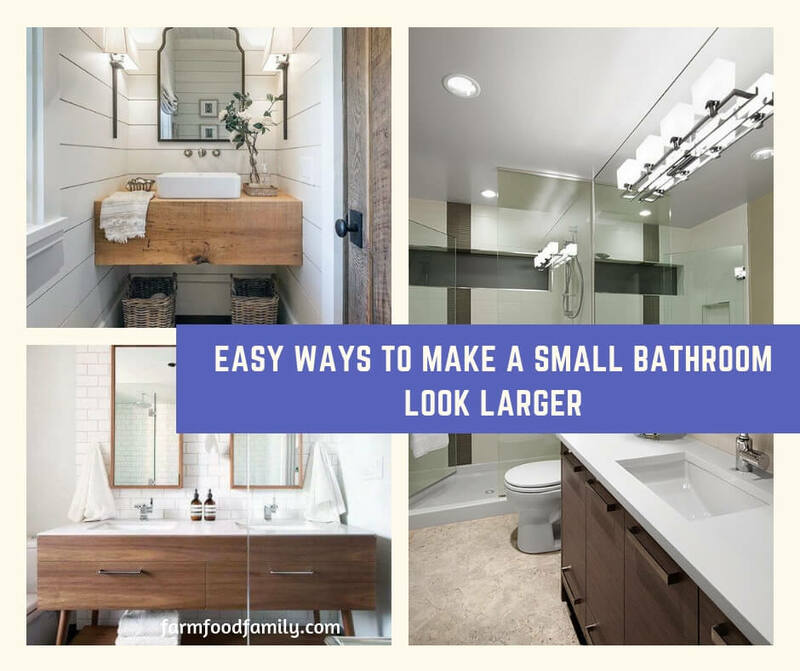 Here are some easy and cheap decorating ideas for small bathrooms to help create the illusion of space and a make a small bathroom look and feel larger than it actually is. Mirrors are a great way of creating the illusion of space. Homeowners can either use a large mirror over the sink or even, two mirrors. Since mirrors go on the wall, they will hardly take up any space and will pick up the lighting and the color of the bathroom, giving the bathroom a spacious feel. Lighting is another cheap and easy way to decorate a small bathroom and create the feeling of space as well. Simply adding a countertop lamp or wall sconces can add to the brightness of the room. Using lighting to focus on areas such as the mirror or sink will also make the bathroom feel larger. Clutter and disarray are a small bathroom’s worst nightmare. Too many things on the walls, shelves or storage racks can fill up the bathroom making it look crowded and untidy. A small bathroom should be essentially free of all clutter. Keep a few towels folded neatly, store essentials in tidy little baskets and boxes and display only one or at the most, two pieces of wall art. An organized and tidy small bathroom automatically looks larger and better than a cluttered one. Here are some more cheap and easy-to-do tips for small bathroom decoration. Use light colors to make the room seem larger than it actually is. If using wallpaper, stick to prints that are subtle and not too busy or crowded. Add dashes of bright color by using colored towels or even, brightly colored flowers. Use glossy tiles and flooring to reflect light and give a lighter, more spacious feel to the bathroom. Eileen Cannon Paulin in Decorating for the First Time suggests using wall-hung shelf units for storage and order. Always keep the bathroom clean and dry. Add a room freshener or a basket of potpourri to keep it smelling fresh and clean all the time. Since display space will be limited, showcase only a few special items to add character and personality to the bathroom. Decorating a small bathroom to make it feel larger does not always requires breaking down walls or investing in expensive decorating projects. A little imagination and a few simple inexpensive decorating ideas, such as these, can help homeowners decorate a small bathroom and create the illusion of space easily.